The events that I attend usually give out gifts as appreciation for attending. Through the many press conferences I've been attending lately, I've been able to accumulate a substantial amount of gift certificates. Not all though are easily usable as some include dental services, ear piercing, or a purchase requirement. 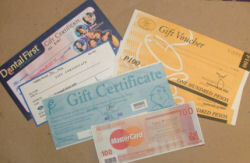 Food gift certificates though are always a treat as you just need to think about what you'll be ordering on the menu. I have certificates for restaurants, coffee shops, video arcades, health & beauty services, dental services and a department store. I remembered The movie "For Love Or Money" staring Michael J. Fox where he worked as a concierge at a hotel and had lots of contacts where he traded gift certificates and tickets of all kinds (concert, baseball, basketball etc.) with other people to get the best deal ever. I wish I had some trade partners as well. Like trade my facial gift certificate for a coffee gift certificate or may be concert tickets for fine dining. For now, I've decided to save these gift certificates and give them away this Christmas to those who I seem would greatly benefit and appreciate it. If you receive any of these next month, you're welcome. Thanks a lot, Jay, in advance. Mwahahahaha! *raises hand* Over here please!! In return, I will give you an entire box of toothpicks! How does that sound?hehe. What Time Is Lunch ?